NASA's Terra satellite captured this visible image of Tropical Cyclone Dineo in the Mozambique Channel on Feb. 14, 2017. The Mozambique Channel is the body of water bordered by the island nation of Madagascar to the east and Mozambique on the mainland African continent on the west. On Feb. 14 , Dineo had maximum sustained winds near 63 mph (55 knots/102 kph). Dineo's winds are expected to reach hurricane strength later today, February 14, and peak near 75 knots by 7 a.m. EST (1200 UTC) on February 15. Dineo was located about 78 nautical miles west of Europa Island near 22.5 degrees south latitude and 38.6 degrees east longitude. Dineo was crawling to the southwest at 3.4 mph (3 knots/5.5 kph). 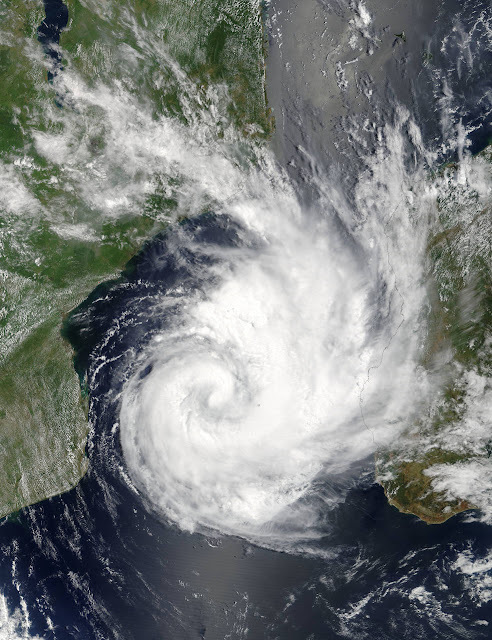 Residents of Mozambique should be preparing for the storm's landfall. As Dineo continues to strengthen and move toward Mozambique, residents can expect heavy rainfall, strong surf and hurricane-force winds. Dineo is forecast by the Joint Typhoon Warning Center to make landfall along the east coast of Mozambique on February 15 around 2100 UTC (4 p.m. EST) at hurricane-force.